To prevent food poisoning, meats and dairy products should not be stored past their use-by dates in the refrigerator and recommended food storage guidelines should be followed for frozen items to ensure quality. Most meats will keep for several months in the freezer as long as they’re stored in a freezer bag or wrapped tightly in plastic wrap. 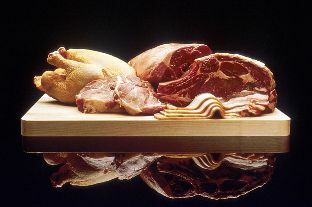 See How Long Foods Keep for informaton on how long various types of meat can typically be stored in a fridge or freezer.